Al-Hadi Learning Organization provides an enriching environment for both students and staff to grow personally and professionally. Teachers enjoy collaborative opportunities to work with other educators and community partners as well as autonomy and flexibility within the classroom. 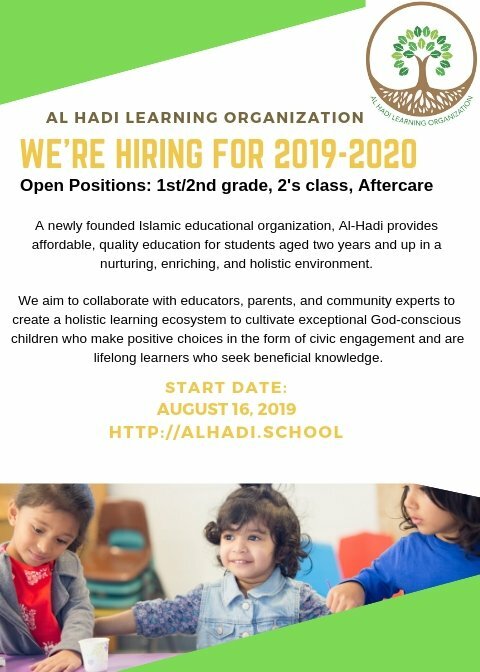 As a newly founded Islamic educational organization, Al-Hadi provides affordable, quality education for students aged two years and up in a nurturing, enriching, and holistic environment. 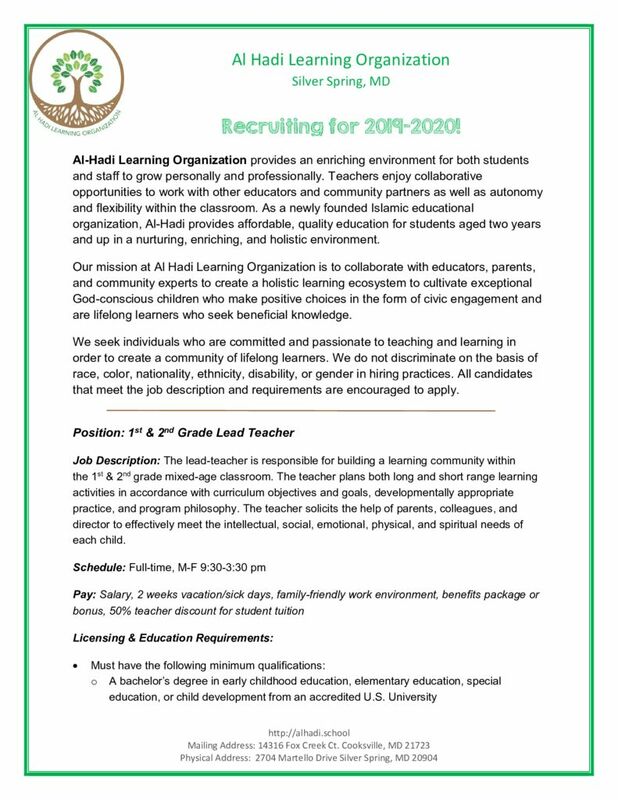 Our mission at Al Hadi Learning Organization is to collaborate with educators, parents, and community experts to create a holistic learning ecosystem to cultivate exceptional God-conscious children who make positive choices in the form of civic engagement and are lifelong learners who seek beneficial knowledge. We seek individuals who are committed and passionate to teaching and learning in order to create a community of lifelong learners. We do not discriminate on the basis of race, color, nationality, ethnicity, disability, or gender in hiring practices. All candidates that meet the job description and requirements are encouraged to apply. The lead-teacher is responsible for building a learning community within the 1st & 2nd grade mixed-age classroom. The teacher plans both long and short range learning activities in accordance with curriculum objectives and goals, developmentally appropriate practice, and program philosophy. The teacher solicits the help of parents, colleagues, and director to effectively meet the intellectual, social, emotional, physical, and spiritual needs of each child.